25 year djing one of the most popular & mystical djs of Portugal, almost play in over 450 clubs & discos and is RED BULL Portugal dj from 2000 until today. RUI REMIX is also known as DJ SUGARBABY and got is new mix cd on stores in 20 august with the international known DJ PETE THA ZOUK (Portugal night 2005) mixed for living the night. RUI REMIX or SUGARBABY born RUI FILIPE ALMEIDA in LISBON 01-07-1965 and live in Cascais from the age of 2 years old and began to play in garage parties and school parties at the age of 14. 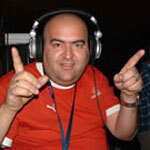 Now rui remix almost plays in more then 450 clubs and discos and made this year 2005, 25 years playing.